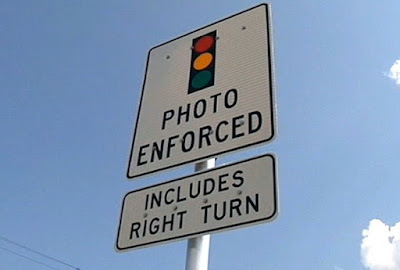 In the three years since I wrote to you last, the following California cities have shut down their red light camera programs: Baldwin Park, Cerritos, Davis, Highland, Laguna Woods, Marysville, Modesto, Napa, Oakland, Oceanside, Riverside, San Rafael, Santa Ana, Santa Clarita, South San Francisco, Stockton, Victorville, Vista, and Walnut. It is also noticeable that in Elk Grove there's been no significant drop in ticketing over the years, something that is supposed to happen in the presence of heavy enforcement. Here are the annual totals of ticket for the last seven years. A high proportion of violations by visitors could explain why the number of violations has plateaued at high levels. In 2016, as part of their attempt to renew their contract with the City of Marysville, Redflex supplied the City of Marysville a chart (Attachment D) showing the percentage of tickets received by visitors in a number of Redflex' local client towns. The chart showed that 69-percent of Elk Grove's tickets went to visitors. Because of Elk Grove's high percentage of right turn violations, combined with that high percentage of visitors (who are unlikely to have their driving behavior improved by cameras they don't know are there), I would like to suggest that the council ask staff to identify the specific intersections where the danger from rolling right turns remains high and consider installing "blank out" signs programmed to light up and prohibit all right turns during the riskiest portions of the signal cycle. The City should not stand by and allow the running to continue unimpeded. I would also like to suggest that before you consider the proposed three-year extension, you ask your staff to do a report similar to the one San Francisco did but with a focus on accidents arising from rolling right turns. And publish the report ahead of time, so that the public has an appropriate amount of time to review the report and comment on it. Thanks for the well-researched article. It takes courageous city leadership to willingly wean itself off of a cash-cow and admit the red light cameras are no longer good public policy--emphasis being on "courageous". Ask yourself when has Elk Grove leadership ever taken the lead on any issue of statewide or national significance? In the words of Paul Harvey, "Good Day!"